The Highlanders now need four points in their final three games to clinch an immediate return to the top flight. Thistle had the best chances, Blair Spittal and Shea Gordon going close. Scott Fox also had to look sharp to deny Scott McDonald and Steven Anderson, while County were denied a penalty when Steven Anderson challenged Ross Stewart. County could now win the title next weekend if they win at Ayr United on Friday and Dundee United fail to win at Inverness Caledonian Thistle the following day. 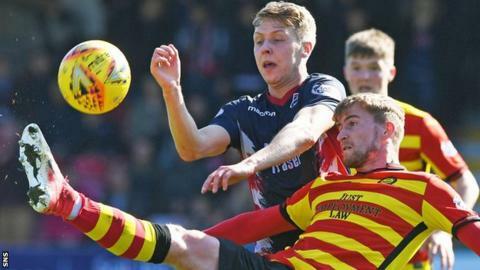 Ross County co-manager Steven Ferguson: "We've had better performances, but the schedule of games we've had in the last month kind of took its toll again a little bit. "But we can't question our players and the way that they keep putting their bodies on the line and trying their very best. We're so close to where we want to be." Partick Thistle manager Gary Caldwell: "I thought we played extremely well and, if anything, deserved more and, if we had been more clinical in the final third, could have got more. "The game in hand we have is very important and the league table will only matter after the last game of the season."